Eating and Reading: J.T. Toman's Banana Ice Cream and "Picking Lemons"
Though cozy mysteries can and should be read at all times of the year, winter brings with it the perfect weather for curling up inside and reading mysteries by the fire. That same weather also makes it the perfect time of year to fire up the oven and experiment in the kitchen, and Cozy Cat’s cookbook, Cozy Cat Cooks: Over 20 Authors Share Recipes, will help you expand your repertoire with enticing recipes from your favorite Cozy Cat Authors. The cookbook can be purchased from Amazon. 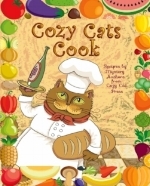 This winter, Cozy Cat will be publishing four installments of an “Eating and Reading” blog series where recipes from Cozy Cat Cooks will be paired with one of Cozy Cat’s mysteries. This week, we’re whipping up J.T. Toman's Banana Ice Cream, an easy, quick recipe to make so you can fulfill your dessert cravings and be back reading her gripping novel, Picking Lemons, in under five minutes. Picking Lemons is available for purchase from Amazon. Below you’ll find the recipe for this scrumptious frozen treat. 1. Put sliced banana pieces into food processor. 2. Process on high speed until the banana is smooth and creamy. **A word of warning. At first, the mixture will look grainy. Keep processing! Suddenly, like a miracle, your mixture will turn smooth, creamy, and delicious! 3. Eat immediately or place in a container in the freezer. **For variety, you can add other ingredients (like peanut butter, chocolate pieces, or maple syrup) once the ice cream had become smooth and creamy. Two batches of Banana Ice Cream, one with 1 tablespoon of peanut butter and 1/4 tablespoon of cocoa powder, the other with 1-1/2 tablespoons peanut butter and 1 tablespoon cocoa powder. Thanks for tuning in for our "Eating and Reading" series, and be sure to check back in after the new year for more exciting content from Cozy Cat Press!